The audience will have a secret to keep along with the cast at the end of each performance. The Mousetrap, the famous murder mystery by Agatha Christie, is returning to the Strauss Theatre Center's stage October 27th, through November 4th. Anita Brren, Natalie Weaver, and Michael Tran share details for Strauss's upcoming production, The Mouse Trap. In the classic Agatha Christie fashion, The Mousetrap, is the story of a group of strangers who find themselves trapped by a snowstorm in a small country home. These strangers soon realize there is a murderer in their midst, and the already poor situation turns more sour. There are more than enough secrets to be found throughout this play. The actor who plays Christopher Wren, Micheal Tran, shares that the play feels like a game of Clue at many points throughout the production. 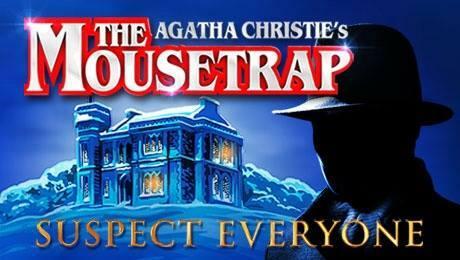 The Mousetrap is the longest running play in the history of London's West End. Anita Breen, the general manager at Strauss, shares that, " We have done this play in the past, and it has been well received. When we were looking for something this season, it was a good fit." The play will be shown October 27th and 28th at 7:00 p.m., October 29th at 2 p.m., and November 3rd and 4th at 7:00 p.m.
Tickets are $30 for adults and $10 for students and can be purchased by calling the box office at (318) 323-6681.More information on Strauss Theatre Center's production of The Mousetrap can be found here.